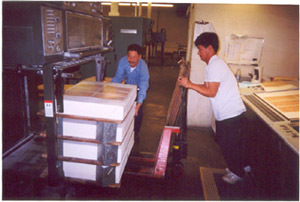 Paper is loaded on to the Heidelberg Speedmaster Printing Press at Hearn Lithographing, Inc. in Houston, Texas. 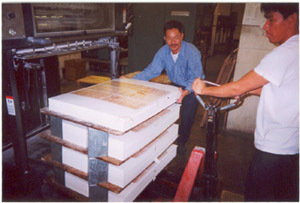 Paper loaded ready for the first run on the first six pages of the Texas Declaration of Independence Prints. 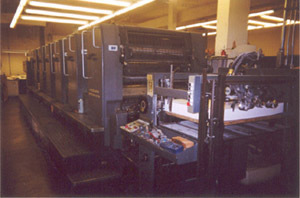 Heidelberg Press underway with the first run. 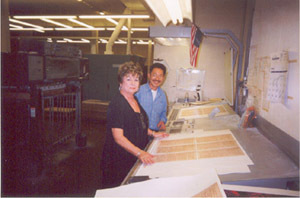 Prints are inspected by Dee Bickley, President of Hearn Lithographing, Inc. with Head Pressman, Dau C. Huynh. 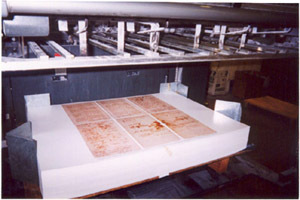 Close up of proof table. 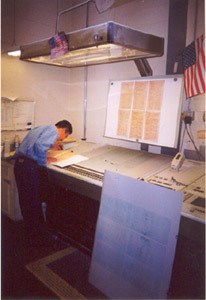 Head pressman, Dau C. Huynh checks color density on first run. 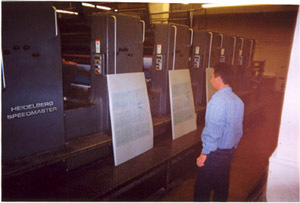 Plates are changed for second press run of six pages. 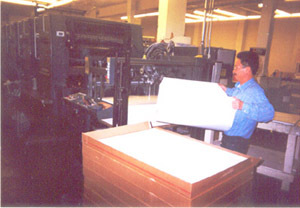 Finished first run Texas declaration are moved out of the press by Huynh and pressman Tai N. Lam. 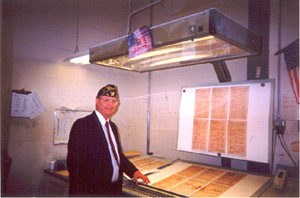 James K. Mitchell, Jr., Publisher and Officer in the American Legion Post 78 of Jasper, Texas examines the first Prints of the second six pages of the Texas Declaration. Close up on the early Prints coming off the press. 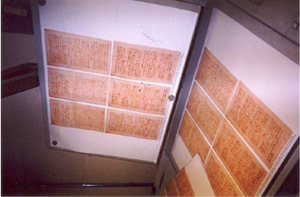 This second set of six pages contains the signatures of the 59 Delegates to the Convention at Washington-on-the-Brazos. 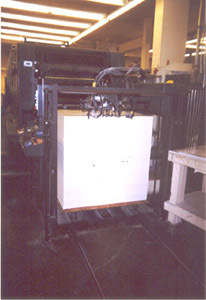 Finished second run of the last six pages of the Texas Declaration Prints. 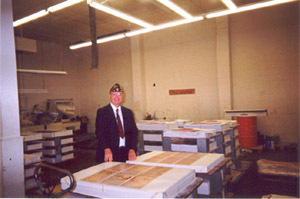 Publisher, James K. Mitchell, Jr. stands with the final Prints completed before the final trimming. 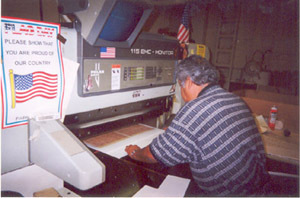 Final trimming of the Prints.